New York, NY - Civil rights lawyers on Monday raised the first opposition to New York Police Department efforts to spy on Muslims, an operation that politicians have been reluctant to even discuss. The lawyers asked a federal judge in Manhattan to force the NYPD to turn over records about clandestine police programs that monitored all aspects of daily life in Muslim neighborhoods. The request represents the first official action against the NYPD since The Associated Press revealed how the police intelligence programs operate. A small number of Capitol Hill and New York lawmakers have called for greater oversight and controls over the police department’s intelligence unit. But most in politics, including President Barack Obama, have shown no interest in even talking about what the NYPD is doing, much less saying whether they support it. That reluctance shows how, a decade after the attacks of Sept. 11, 2001, the nation still isn’t sure how it wants police to prevent terrorism. Despite speeches, policy papers and press releases about cooperating with Muslim communities, most politicians see only political risk in speaking for or against programs that singled out Muslims for investigations aimed at preventing another attack. In speeches, Obama has spoken out against casting suspicion of Muslims. He has equated discrimination against Muslims with the racial inequities that led to the civil rights era. Obama also has said that the war against terrorism must not be seen as a war against Islam. Such programs were built with help from the CIA, which sent a veteran officer to New York to help oversee the efforts and which allowed an NYPD detective to complete its espionage course. One of the agency’s most senior clandestine operatives recently moved to the NYPD to work inside the department’s intelligence ranks. In an interview with the AP, Obama’s counterterrorism adviser, John Brennan, called the NYPD’s efforts heroic, but the White House said afterward that he was not endorsing its programs. He was not denouncing them, either. Homeland Security Secretary Janet Napolitano, whose agency spends hundreds of millions of dollars a year on the NYPD, and the assistant attorney general for civil rights, Thomas Perez, similarly sidestepped questions about the programs. 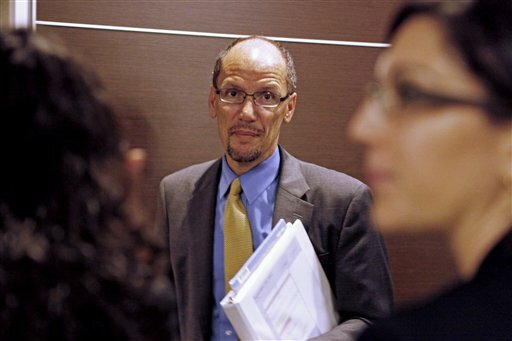 Perez after a recent speech refused even to speak when a reporter asked repeatedly whether the Obama administration considers black Muslims an ancestry of interest. The court documents filed Monday were part of a decades-old class-action lawsuit against the NYPD for spying on war protesters and activists. Since 1985, a court order has limited how the department can monitor activities protected by the First Amendment. Police are not allowed to collect and store information about innocent people that is not related to criminal or terrorist activity. “Based on this evidence, there is reason to believe that the NYPD retains records of surveillance of public places that are not limited to information pertaining to ‘potential unlawful activity or terrorism,’” lawyers told U.S. District Judge Charles Haight on Monday. The court filing including copies of the AP’s investigative stories and internal, secret NYPD documents that AP had published. NYPD spokesman Paul Browne didn’t immediately respond to a message seeking comment. He has previously said police only follow leads and do not trawl neighborhoods. Documents obtained by the AP, however, show a secret team known as the Demographics Unit was instructed to canvass neighborhoods looking for businesses catering to one ethnic group, Moroccans. The documents indicated plans to build databases for other ethnic groups showing where they eat, work, pray and shop. Collins criticized the Obama administration for not having an effective plan for combatting domestic terrorism, a plan that could ensure accountability and effectiveness of such programs. Some U.S. lawmakers, including Reps. Yvette Clarke, D-N.Y., and Rush Holt, D-N.J., have said the NYPD programs are blatantly racial profiling and have asked the Justice Department to investigate. Two Democrats on congressional intelligence committees said they were troubled by the CIA’s involvement in these programs. Rep. Jan Schakowsky, D-Ill., a member of the House Intelligence Committee, said Congress should have more oversight over programs that it has helped finance and train. Rep. Peter King, R-NY, the chairman of the House Homeland Security Committee and one of the most vocal supporters of the NYPD, said criticism of the police programs amounts to little more than political correctness. He said Police Commissioner Raymond Kelly and his team deserve medals and, while he acknowledges the tactics push the envelope, he said they were legal. King is joined by liberal Democrat Gary Ackerman, whose diverse New York district includes parts of Queens and Long Island. Ackerman was a sponsor of a racial profiling law that would have prohibited police from taking race, religion or nationality into consideration at all when making even preliminary investigative decisions. Ackerman said he doesn’t think that would have precluded the NYPD’s programs, such as the Moroccan Initiative, which built a database of Moroccan businesses around the city, photographed stores owned by Moroccans and sent plainclothes officers to eavesdrop in Moroccan neighborhoods. Being under surveillance is different from being pulled over, he said, because people didn’t know about it and complain about it. Ackerman said the signers of the Constitution could not have contemplated the threat of terrorism so any discussion of civil rights and law enforcement needs to understand the post-9/11 reality. Police need the ability to infiltrate Muslim neighborhoods, he said. “If you’re looking for fish, you have to go to the pond,” he said. Both King and Ackerman compared the NYPD’s programs to the way police took down the Mafia. It was a different strategy then, however. Police did not put the entire Italian community under scrutiny and try to infiltrate all aspects of Italian life. Rather, they focused on infiltrating a criminal organization, said Joseph Coffey, a retired NYPD detective who helped take down mob boss John Gotti. But Coffey said the terrorist threat is different. Terrorists in the U.S. don’t organize themselves like the Mafia and they blend so easily into the community that the entire community must be infiltrated. But in a discussion that pits American Muslims, who are perhaps the nation’s weakest advocacy group, against the New York Police Department, the most common response from Capitol Hill has been silence or ambiguous statements that avoid the issues altogether. The normally outspoken Democratic Sen. Chuck Schumer, New York’s most powerful voice in Congress, has repeatedly declined to discuss the issue. Schumer, who endorsed Kelly to be the next FBI director, would neither defend Kelly’s programs nor criticize them. Sen. Joe Lieberman, I-Conn., the chairman of the Senate Homeland Security Committee, issued a statement about law enforcement being a crucial partner in fighting terrorism. Rep. Jose Serrano, a New York Democrat who has criticized what he sees has racial profiling in immigration enforcement, would not say whether he supported the NYPD’s programs. Ackerman said taking sides on this issue is risky because “racial profiling” is so politically charged. “It’s a bad thing for society because we should be having this conversation,” he said. In New York, where the city council has the authority over the NYPD, there have been no hearings on the department’s intelligence programs. Many council members learned about them for the first time in the news. A few members said they have talked about trying to hold hearings but said they don’t know whether the political will exists. “I’m troubled by the extent that New Yorkers, in this case Moroccans, but who knows who else, can be under surveillance for nothing other than their ethnicity or religion or their appetite for Moroccan food,” said Brad Lander, a councilman from Brooklyn. Daniel Dromm, who represents Muslims in his diverse Queens district, said he had serious concerns that civil liberties were being trampled on. Those concerns were only heightened, he said, after Kelly announced that the NYPD had the ability to shoot down an airplane. This is akin to asking a football team to release their playbook before the game. Of course adjustments will be made by anybody guilty. Stupid lawsuit. That bring said they should follow other ethnicities as well to keep things fair. If Islamicist terror is being fomented in the Moslem communities and the mosques, then it's not only fair game to surveil them, but necessary to protect the public! This is the reason why we have to shut up the media for uncovering all our secrets of fighting the terrorists. If its here or abroad. They always make things worse. Yes we live in america but but but. But while your at it, ask for the records for what's going on in Crown Heights. Why only be worried about unfair treatment of the Muslims? Don't these trouble making liberals realize that national security trumps all. Terroristic acts have made our right and need to be safe a priority. If some toes are stepped on...well that's too damn bad.